Who says nachos can’t be a meal? North Myrtle Beach and the nearby Grand Strand have some of the best nachos you can find anywhere. 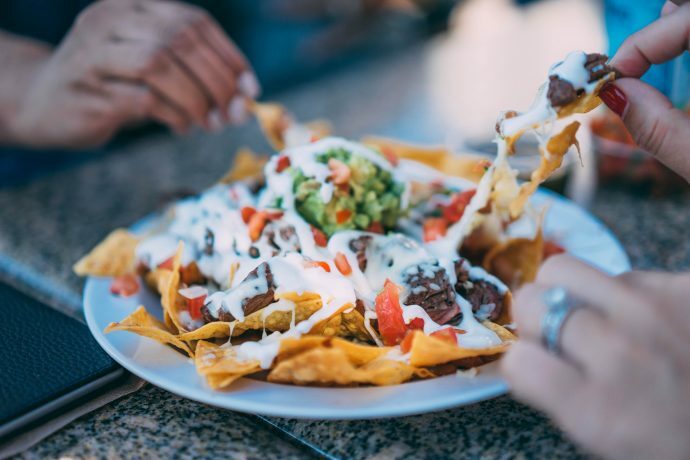 After a long day on the beach, few things are better than biting into some salty, cheesy, nachos piled high with lots of toppings. If you are looking for some of the best nachos on the beach, try these Myrtle Beach restaurants. Nacho Hippo has a variety of different types of nachos and they are all delicious. The atmosphere is fun and casual too. There is often live music and there are seats both inside and outside. It’s decorated nicely and they have $3 margaritas to help you wash down your nachos. This is one of my family’s favorite places to eat. Margaritaville has some loaded nachos that are listed as an appetizer but can easily make a meal. They are piled high with meat, cheese, salsa, and sour cream. Margaritaville is an experience in itself. It’s perfect for the whole family. Mom and dad can enjoy a refreshing drink and the kids can enjoy balloon animals and plenty of entertainment. If you are looking for something a little different, try the duck nachos at Fire and Smoke Gastro Pub. You can find a lot of unique food items on the menu here. The duck nachos are perfect for anyone who wants to try something a little different, but also wants to combine it with something familiar. The drink is pretty great here too. Peaches Corner has been a popular eatery in Myrtle Beach for decades. It looks like an old diner, and that’s exactly what it is. Don’t let the old-fashioned décor full you, this place knows how to make some modern food, including nachos. Try them with a burger or hot dog and watch as people drive down the strip. You can’t beat the location or the prices. When you go to the beach, you want seafood, but what if you also want nachos? Just head on over to Dirty Don’s Oyster Bar and Grill and you can get the best of both world. The seafood nachos are delicious. Get them as an appetizer or a meal. Don’t forget to try some drinks while you are there.